INTO THE WOODS is a very dark musical fantasy that takes the original, darker versions of some famous fairy tales, from Cinderella and Rapunzel to Little Red Riding Hood and Jack and the Beanstalk and jumbles them together. Despite some fantastic sets and professional acting, INTO THE WOODS is an eclectic pagan mess with occult content that fitfully stops and starts and teaches contradictory themes. 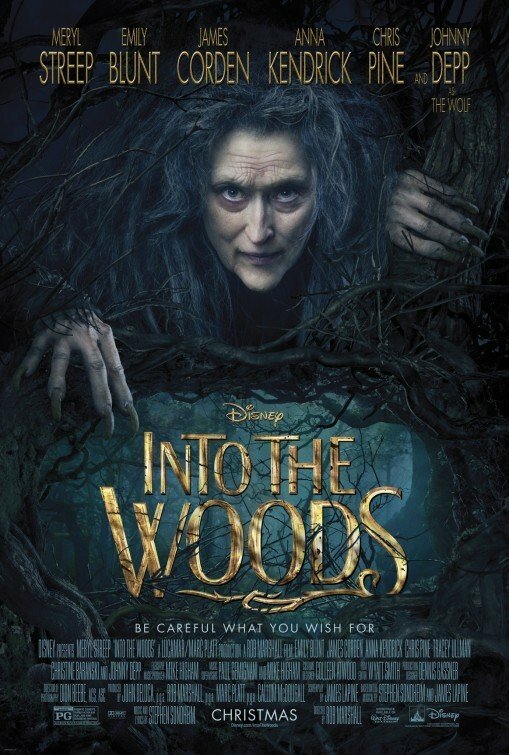 INTO THE WOODS was a musical play that should not have been turned into a movie, or the filmmakers should have completely restructured the play to make it work as a movie. As it is, INTO THE WOODS is a very dark musical fantasy that has plot points that seem like intermissions and that stops halfway through, only to start again with a new premise. The movie opens with a song saying, “I wish,” where several people are wishing for several things in their life. The baker and his are wishing for as son. Jack of beanstalk fame is wishing for something else. Cinderella is wishing for something else. They all conclude their lyrics saying they’d be willing to give up their life to attain their wishes. A witch appears to the baker and his wife and says she’s willing to remove the curse she pronounced on the baker’s parents. She cursed his noble parents into poverty because they were taking some of her prized vegetables from her garden. One of the things the baker’s father stole from the witch was some magic beans. She will remove the curse if the baker gets her four things: a cow as white as milk, hair as yellow as corn, a cape as red as blood, and a gold slipper. The baker and his wife must go into the woods to find these things. In the woods, the baker sees Little Red Riding Hood going into her grandmother’s house. He forcefully takes her cape as red as blood, but eventually returns it to her after she screams and hollers. Little Red Riding Hood has already met the wolf, played by Johnny Depp, who sings about her as a delicious, plump meal. The wolf eats Little Red Riding Hood, but the baker cuts open the wolf and rescues her and her grandmother. She’s so grateful that she gives the baker her cape. The baker meets Jack, who’s taking his cow to sell it. The cow is barren and won’t give any milk, but the cow is as white as milk, so the baker gives Jack five magic beans for the cow. When Jack gets home, his mother is furious. She throws the beans out the window, and the next day there is the beanstalk to the clouds. Sometime later, Jack climbs the beanstalk, steals the golden egg from the Giant and finally kills the Giant after stealing the harp. Jack wants his cow back, so he tries to buy it back from the baker with the gold. The baker won’t sell, and the cow dies. Meanwhile, one of the two prince brothers has found Rapunzel, the girl whom the witch holds prisoner in the tower. The Prince plans to rescue her. The baker’s wife sees that Rapunzel’s hair is as yellow as corn. So, when the prince leaves, she steals some of Rap’s hair. Meanwhile, Cinderella cleans the fireplace at the house of her wicked stepmother and two wicked daughters. They say she can go to the ball if she cleans up the house and the fireplace. Cinderella has the ability to talk to birds, in this case blackbirds, and they clean things up for her. Through a little magic, she gets dressed in a beautiful gown and goes to the ball. The prince falls for her, but she runs away just before midnight. The baker’s wife sees her in her golden slippers and tries to steal them from her. Cinderella is very indecisive, but she returns to the ball the next night. Then she runs again. Eventually, the baker’s wife gets one of the slippers. So now, an hour into the movie, the baker and his wife have everything they need to break the curse. The witch revives the cow, breaks the curse, gives the baker and his wife a baby, and becomes young again. Now, the story has to start all over again since the first plot problem has been solved. The second plot problem is the Giant’s wife, who’s looking for Jack to take revenge. Some of the characters want to turn Jack over to the giant’s wife. Others want to protect him. Jack runs away. The baker and his wife split up to find him. The baker’s wife meets one of the two princes. They have an adulterous affair. The baker’s wife falls off a cliff as if she is being punished for her sin. The movie meanders, until, by the grace of running out of ideas, the movie ends. The sets, direction and acting in INTO THE WOODS are very good. The problem is, the songs reveal several contradictory worldviews. The first song, “I wish,” feeds the theme of witchcraft and occultism. Another song talks about forgiveness. Another romantic song says you decide what’s right. Another song implies you’re never alone. Another song affirms marriage. All these viewpoints are presented without any reflection that they may be contradictory. In some ways, the Walt Disney Company seems to be trying to revisit its fairy tales by showing the obverse, or dark side, of their princess stories and fairy tales. At the same time, since this is Disney, it almost seems as if someone said we need to put some positive points of view into the movie. The movie’s many plotlines get tedious. One person walked out of the screening. Another person kept saying how boring the movie was. (PaPaPa, FRFR, RoRo, BB, C, OO, L, VV, S, MM) Very eclectic, mixed pagan worldview with magical pagan thinking some strong relativism, some strong Romanticism, some strong moral consequences, a redemptive element of forgiveness, occult content includes witchcraft and spells and characters believe witch can solve plot problems through her spells; one light OMG profanity; some very mean violence includes witch blinds a man, birds attack, boy shoots rocks at female giant with slingshot, wolf eats girl, cow dies, wicked stepmother cuts toe off daughter, and then when the prince sees the blood in the slipper, she cuts the heal off the other daughter so she can wear the slipper; prince commits adultery with baker’s wife, light discussion about baker and his wife are trying to have a child; low-cut blouses on women; and, lying, deception, magical thinking. INTO THE WOODS is a very dark musical fantasy that takes the original, darker versions of some famous fairy tales, from Cinderella and Rapunzel to Little Red Riding Hood and Jack and the Beanstalk, and jumbles them together. A baker and his wife struggle to have a child. A witch says she’s willing to remove a curse she pronounced on the baker’s parents, who stole some prized vegetables from her garden. She will remove the curse if the baker gets her four things: a cow as white as milk, hair as yellow as corn, a cape as red as blood, and a gold slipper. The baker and his wife must go into the woods to find them. The sets, directing and acting in INTO THE WOODS are good. However, the story meanders and becomes tedious. Also, the movie’s songs reveal several contradictory worldviews. The first song feeds the theme of witchcraft and occultism. Another song talks about forgiveness. Another song says you decide what’s right. Another song implies you’re never alone. Another song affirms marriage. INTO THE WOODS is a disappointing mess.